When summer arrives, we start to get messages around sun safety and the harmful effects of sun damage. To fully understand how to avoid sun damage, we need an understanding of how the sun’s energy affects our skin, how we can protect our skin and what SPF actually means. The sun, our local star, is a giant mass of hydrogen atoms constantly undergoing nuclear fusion. The hydrogen atoms are fusing together creating helium atoms and releasing massive amounts of energy. This energy is released in a wavelength spectrum. The longer the wavelength the lower the energy (such as infrared radiation, and radiowave energy), the shorter the wavelength, the higher the energy (such as ultraviolet radiation, UV; gamma rays and x-rays). Visible light is in the middle of this spectrum. Ultraviolet (UV) Radiation is a form of solar energy that is a shorter wavelength than visible light, but can be absorbed by components of the skin. Even though UV represents a small portion of the sun’s energy, it is the main cause of sun damage and skin cancer. 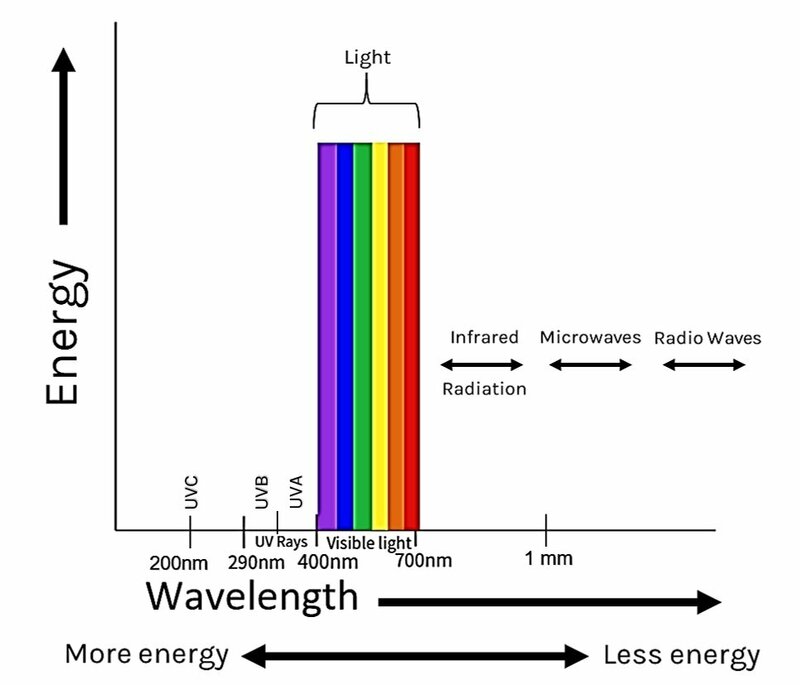 The ultraviolet spectrum consists of energy in the wavelength spectrum from 200nm -390nm; with visible light starting at 400nm and going to 700nm. UVC radiation (200-290nm): is the highest energy and is mostly filtered out by our ozone layer. We can thank the environmental scientists in the 1980’s for discovering the true evil of CFC’s (chloroflorocarbons) for destroying ozone and passing legislation to eliminate their use. UVB radiation (290-320nm): cause sun burns and is what increases our risk of skin cancer. This energy causes changes to DNA which can affect cell regulation and lead to uncontrolled proliferation and cellular invasion (ie. cancer). UVA radiation (320-390nm): stimulates melanin production, but also causes sun damage to the skin. It is less harmful from an oncogenic (cancer) perspective. SPF stands for sun protective factor. An SPF topical or spray is intended to protect our skin from UV rays produced by the sun. The first step to using SPF is ensuring you have a broad spectrum SPF product. 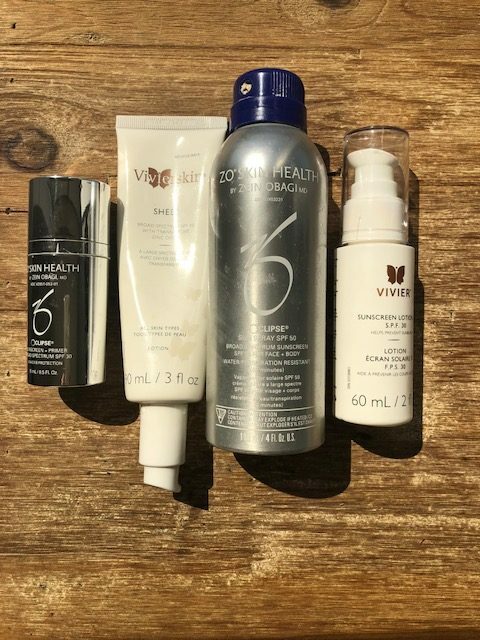 Broad spectrum SPF protects you from both UVA and UVB rays. Second, it’s important to understand what SPF means for your skin. It’s a common conception that the SPF number on the bottle communicates “how long you can be in the sun without burning.” This would suggest that if you exposed a bare arm to sun and would burn after 10 minutes, then applied SPF 15, your bare arm could last 15 times longer (be in the sun for 150 minutes). Where this analogy becomes dangerous, is with sunscreen with higher SPF. An SPF of 30, 60, or 80 does NOT mean that you can apply an SPF 80 and then stay in the sun for 800 minutes (13 hours). Sunscreen is only active for about 2 hours. This means that regardless of SPF, you MUST re-apply after every 2 hours, if out in the sun. From these numbers you can see that SPF 30 blocks about double the UV than SPF 15, and that SPF 60 blocks roughly double the UV than SPF 30. While SPF 60 blocks out twice as much UV as SPF 30, the actual difference is only 1.3% UV. There is a role for SPF 60 for those with fair skin types, but the majority of the population likely only needs to use SPF 15 or 30. Using SPF 60 can be a disservice to some users because they may think they don’t need to re-apply the lotion as often because it’s a higher SPF. Sunscreen is an obvious option for sun protection. But be sure to use broad spectrum sunscreen and apply it every two hours. Apply sunscreen 30 minutes before going into the sun. This will ensure the lotion is absorbed by the skin before you’re exposed to sun rays. If you are in the water or sweating, re-apply sunscreen to avoid burning. There are many skin and makeup products that have added an SPF element to them for skin protection benefits. Using SPF based products daily can protect your face from the again effects of sun damage. To avoid any sun exposure, clothing such as a hat or long sleeve shirt can act as an effective barrier from the sun. Staying out of the sun completely is also an option. If you have accumulated sun damage or have any suspicious moles that need to be checked, please consult your family physician or dermatologist for a skin exam. 1.Reinau D, Osterwalder U, Stockfleth E, Surber C (2015)The meaning and implication of sun protection factor. Brit J Dermatol 173: 1345.